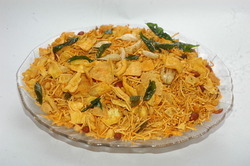 Manufacturer of a wide range of products which include chivda and indian namkeens. The Chivda offered by us is manufactured from a variety of ingredients, which ensure a delicious and mouth-watering taste. Our Chivda is prepared under strict hygienic conditions. It is widely preferred as a party snack that is tasty as well as healthy. We are counted amongst the reckoned names in the industry, offering hygienically processed range of Indian Namkeens that are rich in taste and have long shelf life. They are the best snacks and have mouth watering flavor. We offer them in air-tight packaging thereby delivering an exceptional range of products. Looking for Indian Namkeens ?